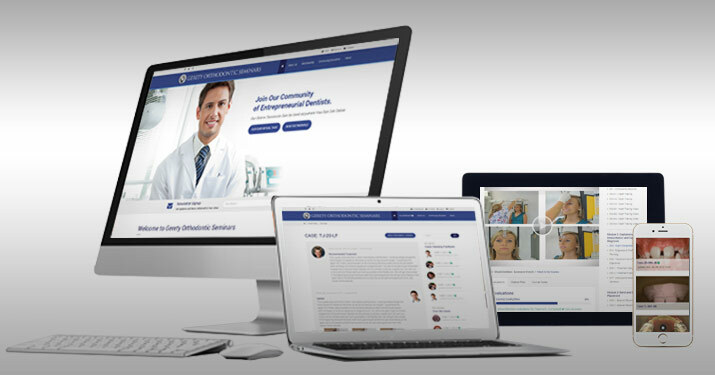 Our member based orthodontic website was designed and developed with your objectives in mind. We provide our members access to the extensive Case Library of Dr. Robert G. Gerety, which features photos and month-by-month descriptions and illustration of the treatment mechanics. Our redesigned forum is an interactive space for our members to discuss topics of concern with experts as well as other members. We offer a dedicated online orthodontic continuing education site for general and pediatric dentists through our courses section. We allow members an online venue to receive help from the Geretys with case diagnosis, treatment planning and troubleshooting through your own personal and private section. Earn CE on the site by completing evaluations and projects. All without leaving your desk. Our Resource Library provides prototype documents that you will need as you integrate orthodontics into your practice. Our member based orthodontic website was designed and developed with two objectives in mind. The first objective is to provide a dedicated online orthodontic continuing education site for general and pediatric dentists through the Continuing Education section. Secondly, to provide our members access to the extensive Case Library of Dr. Robert G. Gerety which features photos and a month by month description and illustration of the treatment mechanics and their application. Our next objective is to provide an interactive website for our members to discuss topics of concern with experts as well as other members through our Forum and to allow members an online venue to receive help from the Geretys with case diagnosis, treatment planning and troubleshooting through your own personal and private My Case section. Our website is supported solely by our membership, you will not be bothered with paid advertising or pop-up ads and we will not sell our member's information to other organizations. To participate in any of our orthodontic continuing education offerings, either of our two levels of membership is required. We are offering a complimentary one year Premium Membership with the purchase of any session of the Online Comprehensive Course. This is a savings of $399.00! Join our membership now and receive our online orthodontic workshop "The Wide Wonderful World of Archwires" as our gift to you with any membership registration. Enjoy this continuing education opportunity with our compliments, a $99 value! Online orthodontic workshop "The Wide Wonderful World of Archwires"
* Membership is for access to the site only. It does not include individual course access outside of the introductory Wide Wonderful World of Archwires workshop. Note: Many of the courses already include a year membership.